I cycle to QEII. I didn't always. 5 years ago I didn't own a bike. I used to drive from Mt Pleasant. That was before the Car park was built and most people had to park offsite at Graylands and bus to QEII. So I had to drive past work, wait for a bus, and then get on a bus to get to work. So I decided to get a bike and ride. Several of my work colleagues cycled and my dad was a keen cyclist (and still is) so I was lucky to have plenty of advice in helping me get a bike and the gear necessary to make it comfortable. I'm a big believer in..
"if I'm going to do something, make it as easy and comfortable for myself as possible". I wasn't that keen on wearing lycra or using clip in shoes but friends who cycled said it was much more comfortable. So I bought a bottom of the line carbon bike, lycra, clip in pedals and shoes, a helmet and front and back lights. I went to TBE in Nedlands just down the road from Charlies. They had a discount for hospital staff. Plus I got a hospital rebate for buying a bike. Dad came and met me when I picked up the bike and rode along with me, showing me how to signal and use the clip in shoes. He also showed me the bike paths around the city and back to where I was living. Which was great. I only fell off twice - when I forgot to unclip. I was a pretty nervous rider to start, but it's hard to express how nice it is cycling around the paths on the swan river. It's so much nicer than driving. I was living 13km away by bike, and it was just as quick to ride as to sit in peak hour traffic. It took me a month to get used to the cycling after which it got a lot easier. Here's a list of why I kept cycling to work. For me it was much faster than driving. It was more relaxing than being in traffic - especially if you get to cycle along the river! My fitness improved - and I didn't have to go to the gym. I was getting to work. I saved money. I was saving at least $5 parking plus $4 of fuel per day. I racked up less km on the car so there were servicing savings too. It took less than a year (200 days) of cycling for my bike and gear to pay for itself. And it was a challenge. It became almost a competition with myself not to use the car. My energy levels increased and I'd start work much more awake and energised after a ride. Cycling was a positive experience for me so I stuck with it. After a while I went and did a cycling course to improve my skills (the same CRT course that is available next month to staff for a discount rate - I recommend it). A few years back I moved to West Perth. I'm now only 5km from work. 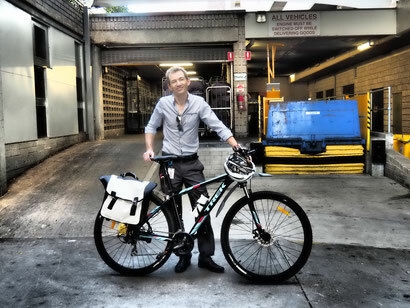 I still cycle, and I bought myself a cheap mountain bike ($500) that can carry 2 bags so I can bring stuff to work. I recommend cycling to work. Here's some things that really helped get me started. 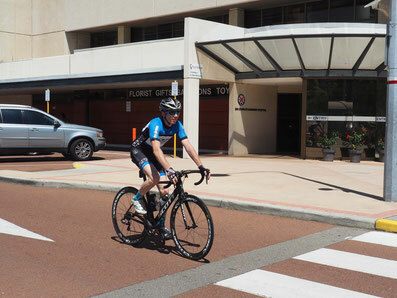 check bike routes from home to work - and find someone who already rides a similar route for advice on how long it takes, where the safest paths/roads are, and how hilly it is. get some advice from a friend on the type of bike that'd be best for you and your distance/needs. spend a little extra on a good seat (test some seats!). consider spending a little extra getting a light bike. The Social Club has a bike page and is collecting routes to get to QEII as well as other cycling related info. So if you're considering cycling check it out.